Match date and time are subject to change till 10 days before the event. We advise to check occasionally the correct date and time and make your personal arrangements for attending the match on the new date and time. Matches scheduled on Sundays, can move to Saturday on same weekend or vice-versa. 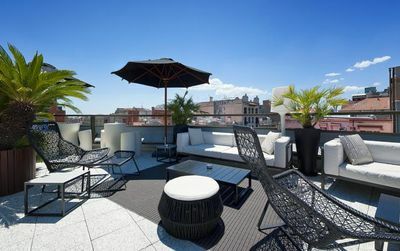 We recommend to come to Barcelona on Saturday morning and leave on Monday morning. We are sorry but no refunds can be made for rescheduled matches - tickets will be valid for the new date and time. 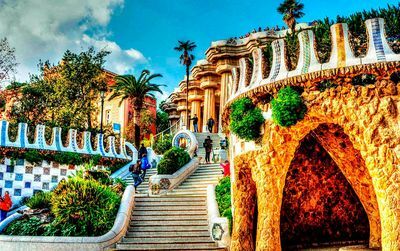 To be 100% sure that you will get your tickets on time, tickets are delivered only to Barcelona and its region, 2 or 3 days before the match by hand to your hotel or private address. For those who do not have an address in Barcelona, an office is open 4 hours before the meeting, near the Camp Nou stadium for tickets delivery. In many occasions, in order to guarantee the Ticket Package availability for our customers, we have to buy the Ticket Package at a higher price than their face value. Hence, our tickets can be more expensive than the tickets real price (face value). After more than 25 years of selling FC Barcelona tickets, we can sell up to 4000 tickets per meeting, which is an organizational challenge and proves our expertise. 1st Official Agency by the number of sales, our tickets and their delivery are guaranteed. Stress in on our side, not yours ! In case of doubt or emergency, we have a telephone number that is there to help you 24/24. This line is open 72 hours before each match of the Barça. Do not hesitate to use it. We answer in several languages. We promise to refund the price of your purchase, when the reason is of the utmost importance, in case you cannot attend the game you must inform us 20 days prior to the game and there will only be a 10% cancelation fee, according to our terms and conditions set out in our web site. These conditions are only valid for the La Liga games, except the games between FC Barcelona - C.F. Real Madrid and the Champions League games. Your Barcelona football ticket for the FC Barcelona vs Real Sociedad : For an extraordinary evening at Camp Nou! Seeing FC Barcelona in its Camp Nou stadium is an unforgettable moment for all those who have experienced it. This FC Barcelona vs Real Sociedad football match will certainly not break the rule. 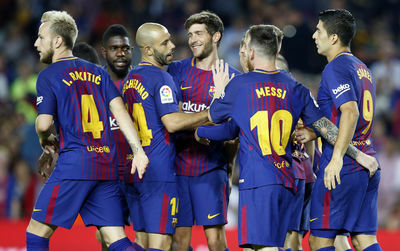 In La Liga, the Spanish Championship, playing in Barcelona is an event for both small and big Spanish teams. They come to Camp Nou to shine and win. Imagine the resistance Barcelona must offer in every match to hold its own. This is typical of the big clubs that can never lower their level of play for the matches with stakes, as against the smallest teams in the standings. Barcelona's club members know it and never let down their guard either. If "Mes que un club" (more than a Club) is their motto, it should not be forgotten that the socios are also owners of the Barcelona FC, once a member through an annual subscription, they have the right to vote for the election of their President. 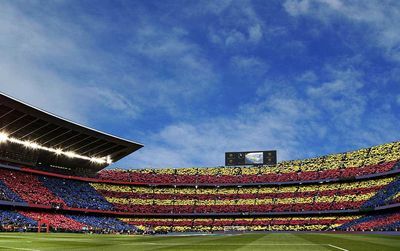 A very democratic functioning that favors the public's enthusiasm during each FC Barcelona match, a family atmosphere also because it is not uncommon to see whole families going to the Camp Nou stadium for each match. So, it's your turn to taste the unequalled emotion of watching a match at Camp Nou, when you buy FC Barcelona Real Sociedad tickets. We are traveling from America to Spain in April 2017 and would like to watch the 16 April match. That date falls on Easter, will there be any changes to that match because of Easter? And if so is it one day prior or one day past? . We are in the middle of making travel arrangements and would also like to purchase tickets for match. Please advise. In addition, we don't have our hotel accommodations yet, can we give ticket deliver information later or pick up at window in Barcelona office? here i hope ma boys will harvest. this is the team of the moment and with the treble idea. Go go go......ale ale ale..